I have used GPS systems for years in rental cars, coming to heavily rely upon the trusty Hertz NeverLost to get me safely from one business meeting to the next with minimal effort. Only on a few occasions was I led astray with NeverLost (e.g. downtown Boston, where it routinely fails to ‘acquire satellites’), in which case I have been left feeling AlwaysLost. As we prepared to embark on this 90-day bicycling journey across Europe – from Holland, to Germany, to Belgium and France – I read several guidebooks cover to cover. All the guidebooks mention the virtues of their own maps and in some cases recommend specific Michelin maps. Now I am not naïve enough to think that a guide book map was sufficient, so I did proceed to purchase several Michelin maps. However, after buying 4 of these maps (at $20/each), I quickly began to realize that I was going to dig a deep hole. To get the degree of accuracy needed for cycling (1:50,000), I would need to buy at least 20+ maps to cover the extent of our entire trip (a 1,000+ kilometers). And, I would still be lost locally when arriving in villages, town and cities with its own circuitous network of streets. 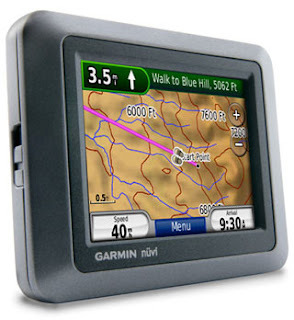 So, I took the plunge and bought a personal GPS device – a Garmin Nuvi 500. It is still too early to extol all the virtues of this device, but it has already made our journey a 100x easier and stress-free. Instead of unfolding, folding and re-folding maps every 20-30 minutes (as we go off a map’s edge in the map case on top of the front pannier), I can now just follow my trusty Garmin. My oldest son, Anthony, affectionately calls the GPS – Carmen – due to the attractive female voice which provides directions with a British accent (I’m thinking Carmen Electra in an Austin Power movie – but with a better British accent). Glad to hear that the wheels are turning, you're all set with gear, and your journey has begun. We are all sending our best for a safe, fun, and exciting adventure! Hi all, it's so great hear of your adventures as they unfold! James, I totally get the need for your GPS gadget. Caleb, love the logo!